Today July 21 is my Birthday! Four days go I received the best gift. 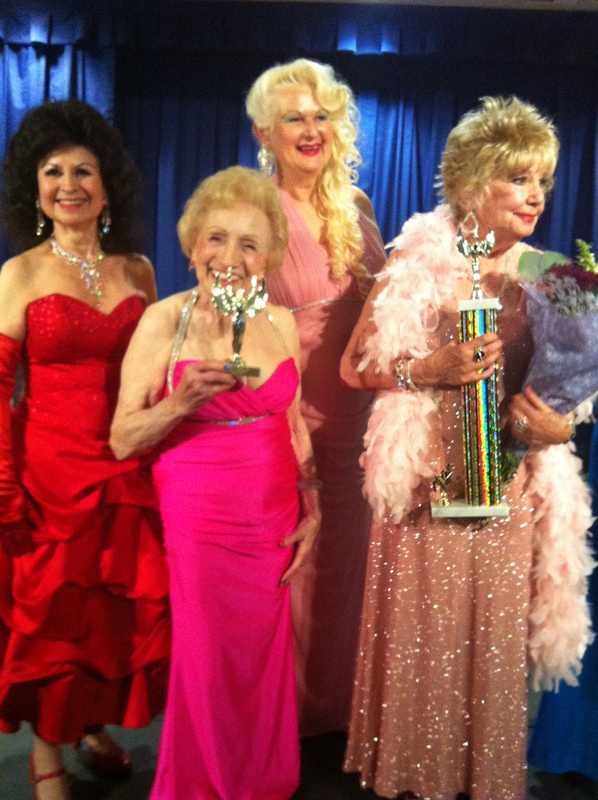 My mother Rosalee Glass won “Miss Congeniality” in the Miss Senior California Pageant . While I always thought she was extraordinary with a vivacious and loving personality, to have others recognize this as well is exciting and reaffirming.No doubt her body language and communication skills contributed to her win. I want to share with you some of the highlights of her experience at the pageant because I think there is a lot we can learn from her . This photo was taken right before she was interviewed by six judges. She was confident and ready to take on any question. She showed no fear and as you can see below she does not take herself seriously. She has fun. She was quick to make friends with everyone in the pageant . As you can see by their body language Rosalee and her fellow contestant got pretty chummy and remained that way throughout the pageant and are now dear friends. 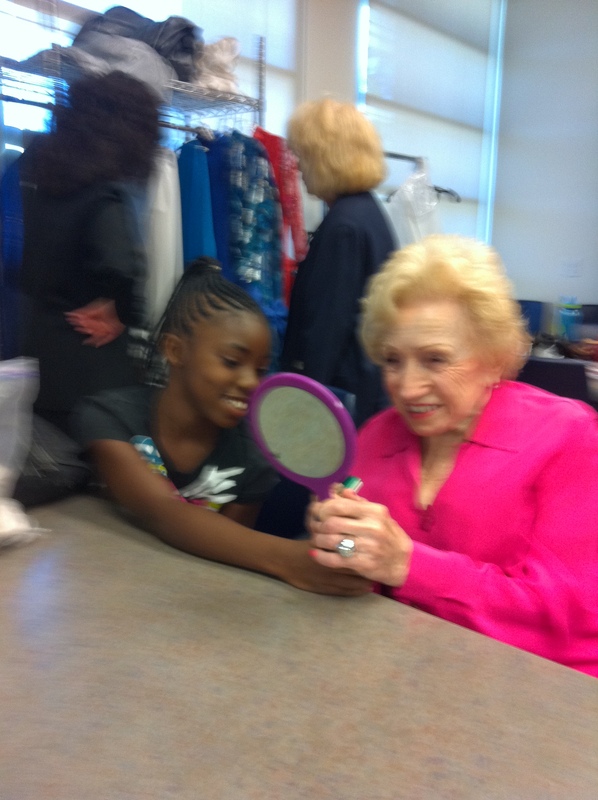 She even made fast friends with one of the contestants ten year old niece who helped Rosalee with her makeup. Then it was time for all the contestants to have their individual pageant photos taken. With her hands at her sides and shoulders back she looks very self confident. 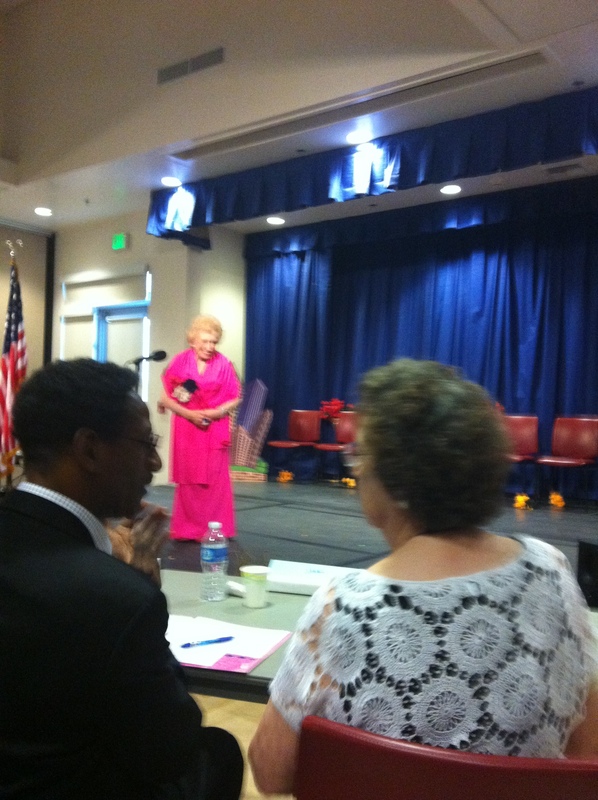 Here you can see her spontaneous warmth and friendliness which she shared with everyone. 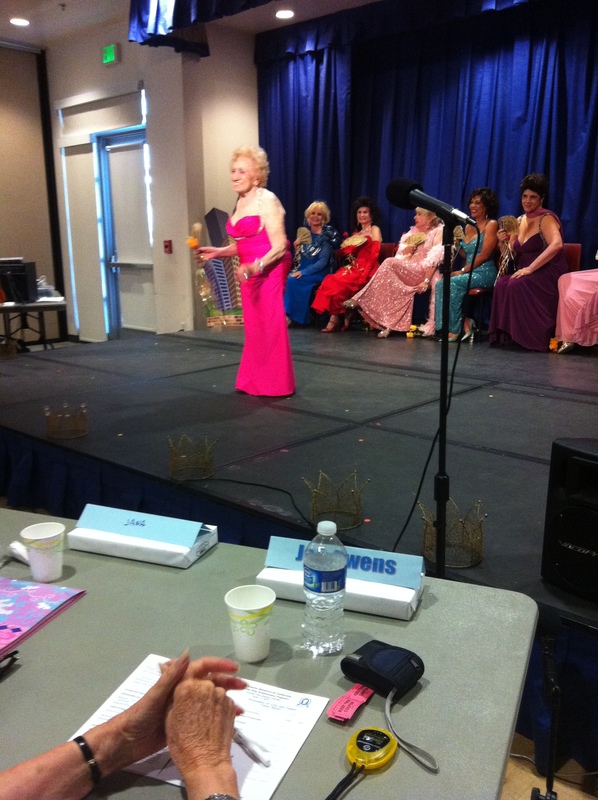 Here she is holding her own with some of her fellow contestants and other beauty queens. 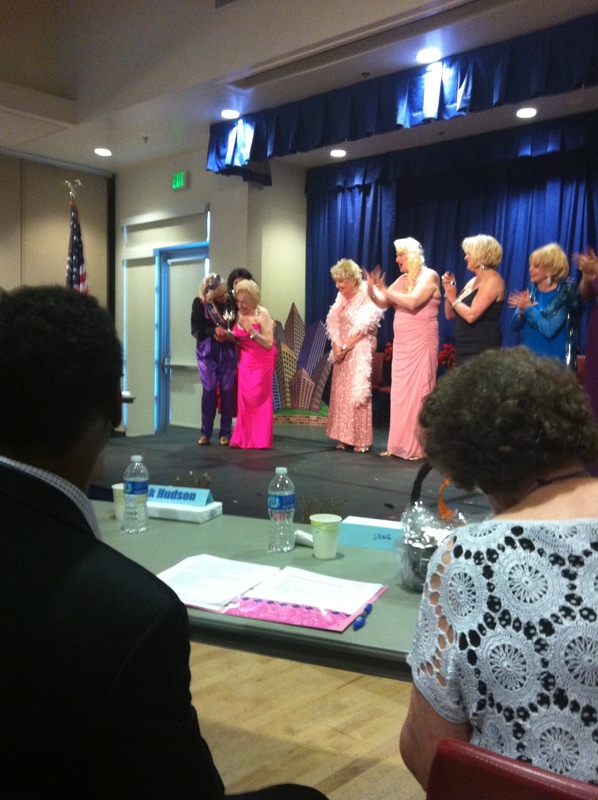 Here she received her official Ms. Senior California contestant pin. She is thrilled to be a part of everything as you can see from her bright smile. Here is where she does her solo dance routine at the beginning of the pageant. 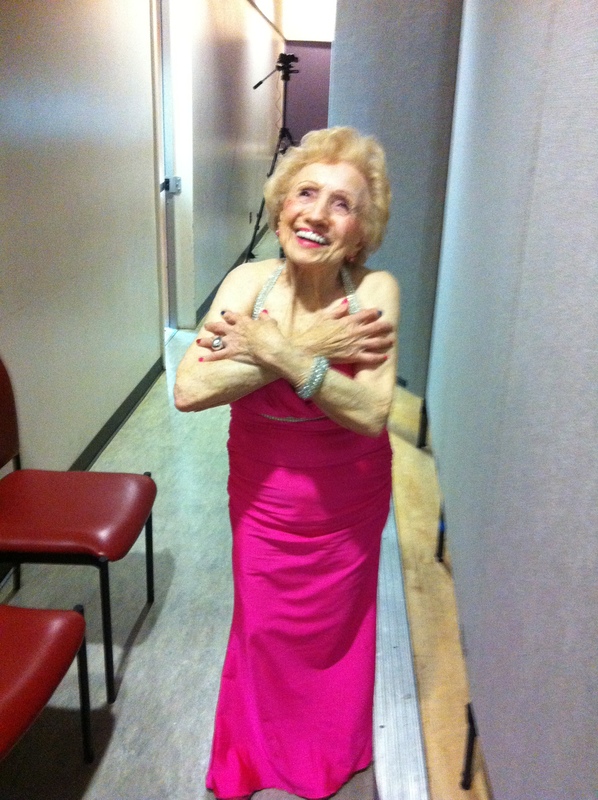 She had no fear even though she never danced in public before. Now she shares her Philosophy of Life which is to be compassionate towards others, to greet others with a smile, to have a positive attitude towards others and to always think what to next. Then it was time for the talent section. 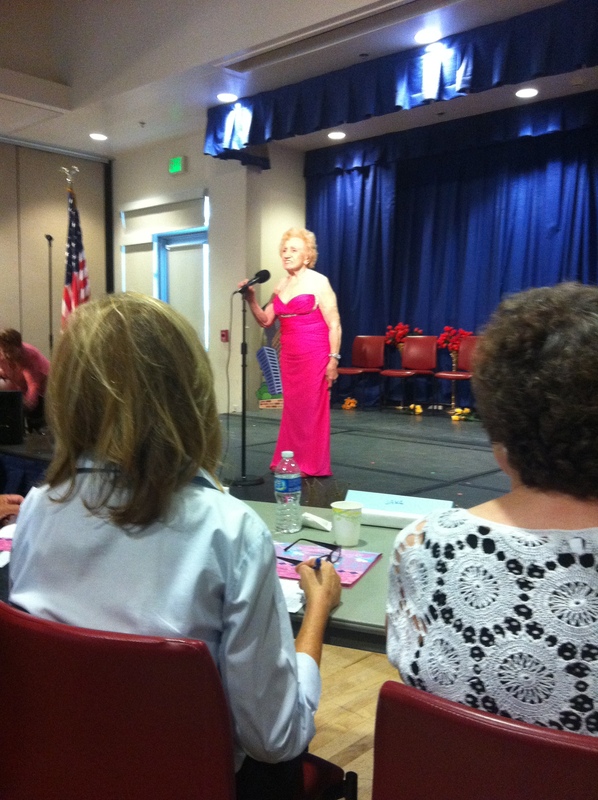 She sang “God Bless America” and received a resounding applause from the audience. She was humbled as you can see from her body language. While almost all of the contestants were a bit nervous to find out whether or not they would be winners, Rosalee was relaxed. Her body language said that she was having a great time and was just happy to be there. Here is a shocked and surprised Rosalee when she heard her name called “for ” Miss Congeniality.” She had no idea she would win. 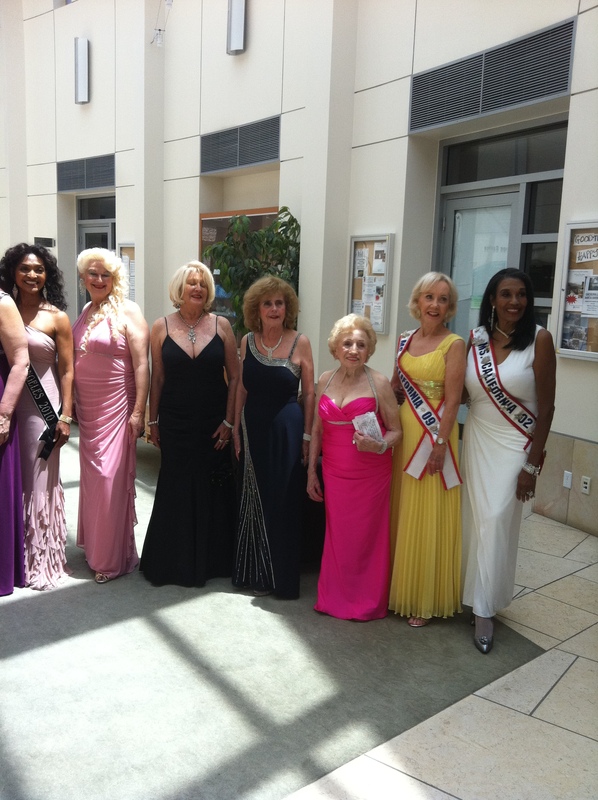 So many people came up to congratulate her after the pageant including Ms. Senior America and her husband. 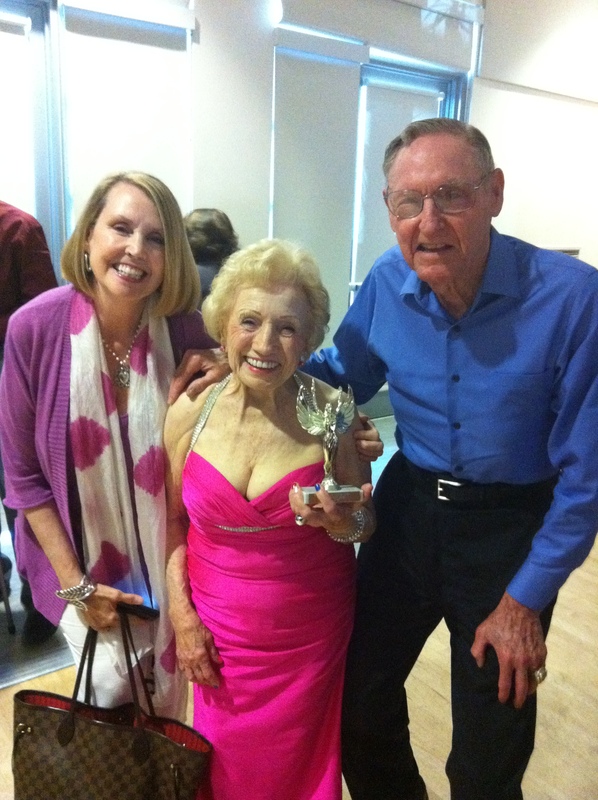 And our dearest friends Joyce and Bill Sharman of the Los Angeles Lakers came to support her and shared their love. Seeing how much love people showed Rosalee and hearing them say how she inspired them, touched my heart . The lesson learned from Rosalee is that when you radiate unconditional love towards others, you get it back tenfold. That was completely uplifting to me, thanks so much! Your mother is just so cute! I can only hope I can age as well and be as happy when I am as old as she is now. And I wish you could read my happy happy body language right now as I smile ear to ear after having read your great article. What an inspiration to us all! You know that first picture of your mother smiling is almost a carbon copy of your smile at the top of the page. Thanks so much and have a great day!! Happy Birthday, Dr. Glass! Love all your insights and especially this one, a tribute to your Mom. 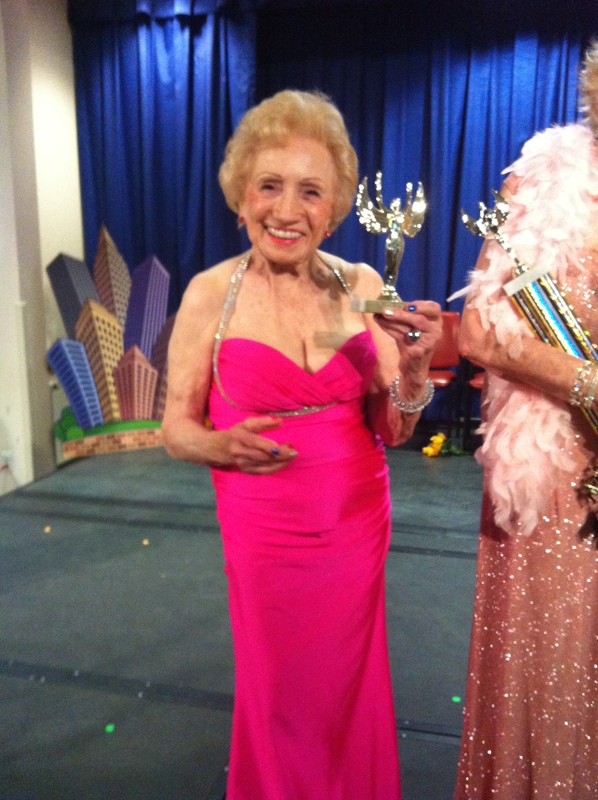 What a great role model she is on how to be loving, positive and have fun at any age! What i liked best is she does all this without taking herself too seriously, something i appreciate b/c i need to remind myself of that now and then. Hope you have a great day. Your mother seems like a remarkable woman, Dr. Glass. She exudes a very caring and fun nature. Happy birthday! Your mother is BEAUTIFUL and SO PRECIOUS! Happy Birthday, Dr. Glass! Have a wonderful day today. Your mother is adorable. Congrats to her! Happy Birthday, Dr. Glass! What a refreshing article. Thank you for sharing that with us, and what a way to honor your mother. Congratulations to you both! Great way to start my day! Happy birthday and congratulations to your beautiful mom! Happy Birthday to you! Your post is a wonderful tribute to your beautiful mother. She looks to be such a joyous person! I enjoy seeing senior citizens who are living happy and productive lives. Thanks for this article, and many happy returns to both you and your mother! Happy Birthday! Loved reading about your mother what a wonderful woman! 🙂 She rocked that dress!! your mom has a beautiful smile and she passed down to you. Love this story! Love these pictures! This is such an inspiring story for everyone to learn something from!! Age is a number! Happiness and joy and love come from within and has no age. Your mother is a true beauty, and a gift from God. I don’t even know her, and I love her too! Such a sweet story, Lillian. Thanks for sharing it, and HER, with us! Happy Birthday Dr. Glass and congratulations to your mom! She’s a very lovely woman. Of all the categories to be awarded, this is truly the most meaningful!What a legacy and best wishes to you both!! I hope I look just half as good as her! Is she, perhaps, looking to adopt any grown step-sisters for you? Just checking because I’m available! But seriously, have a wonderful birthday! Congratulations to Mrs. Glass! Happy Birthday Dr. Glass!! I can’t think of a better early birthday gift. We now know where you get your smile, confidence and presence from. You have a lot to look forward to, how inspiring! God’s blessings on you both. Happy Birthday! And congratulations to your Mom. She is a very special lady! First of all, happy birthday! Secondly, your mother looks adorable!!! You are so lucky! Congratulations to you both! 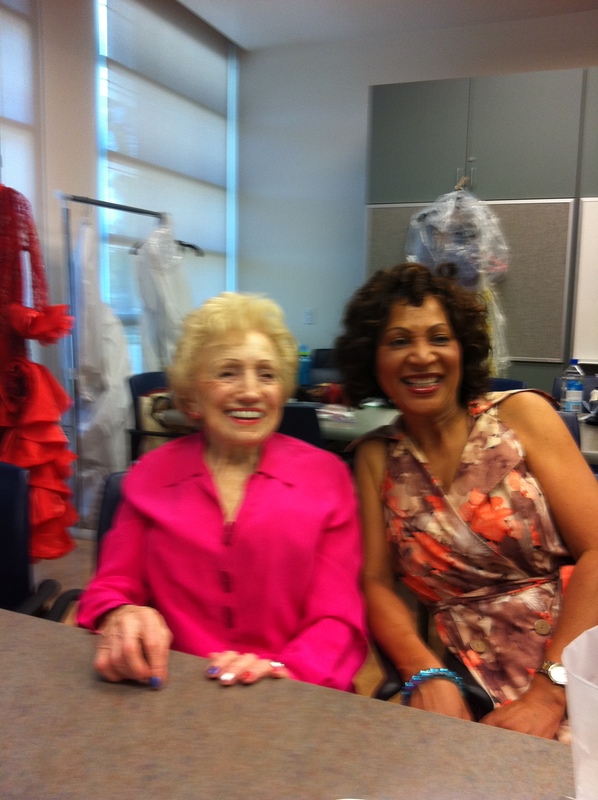 Happy Birthday Dr. Glass, you share your mother’s smile. You were blessed with a radiant Mom, God Bless you both. I can see why she won Miss Congeniality. She seems very charming! PS: I love how your mother still likes her BLING. lol, Your mother is so darling, and tiny and charming. I know she is just full of fun. bless that lovely lady in pink and rhinstones she sparkles! I love how you love your Mom. I think the whole world loves her now too. And hearty congratulations to your Momma!!! These pictures of your mother are adorable! 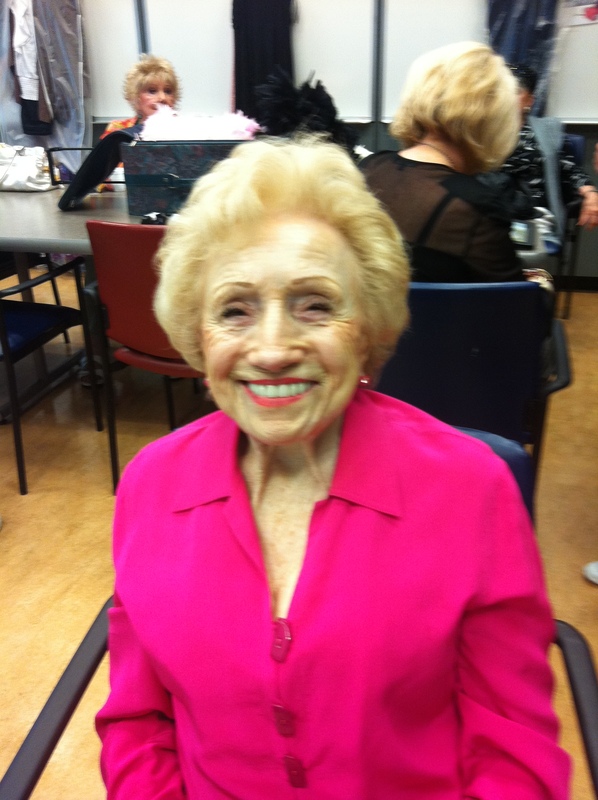 She’s a chamer and reminds me of my grandmother, who I just lost to Alzheimer’s disease. Thank you for bringing a smile to my face today. And your mother looks likes such a joyful person – just genuinely happy to be living her life and shedding her light to others. Our parents are such a gift, I’m glad you haven’t forgotten :). You’re very lucky to have a mom who’s still so vibrant. Mine’s now very feeble which is hard to watch. Happy Birthday Dr. Glass! Your mother is beautiful and now we see where you get your looks from. She reminds me of my grandmother Lillian that I adored. Happy Birthday Dr. Glass, sorry to come one day too late! And congratulations to having such a charming and beautiful mother! She seems to enjoy life so much. I have saved all this in my favorites and will go back to it often, often. Please tell your lovely mother she is a role model for one woman in Stockholm, Sweden! 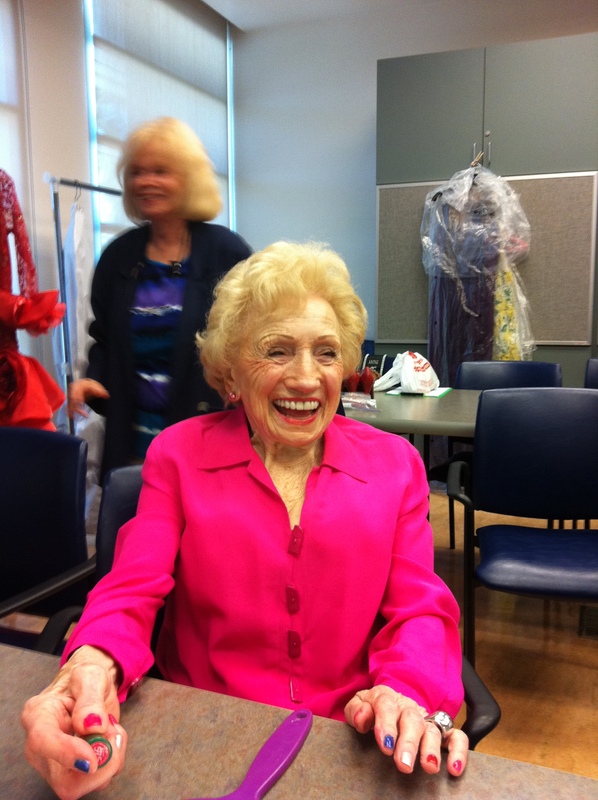 AWWW Dr. Glass how cute is she; sooo little and her smile beams with sunshine!!!! What a great birthday present for you!!! Congradulations to your Mom and a very HAPPY HAPPY BELATED BIRTHDAY TO YOU!!! Cindy Austin from Windham Maine You are sooo blessed each and everyday to still have your Mom in your life!!! I pretty much echo all of the sentiments posted by the posters here Dr.Glass. Such an beautiful, touching, and wonderful example of inspiration! Thank you for sharing your mom’s qualities with us.